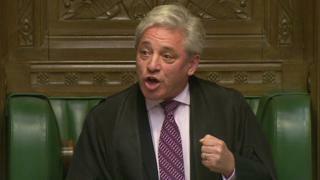 House of Commons Speaker John Bercow has upset some MPs by voicing his opposition to US President Donald Trump giving an address to both Houses of Parliament. But who is the man in the big green chair? John Bercow, 54, sometimes refers to his favourite sport in the Commons chamber, recently revealing to MPs the heights of noisy passion he reaches when watching Davis Cup matches on TV. The minicab driver's son first picked up a racquet at the age of eight. He became Middlesex under-12s champion, but later suffered bronchial asthma and was a casual player only thereafter. He became a member of the Commons tennis team, forming a doubles partnership with future Prime Minister David Cameron. He even wrote a book on his top 20 male tennis players, his favourite being Switzerland's Roger Federer. It was as a schoolboy in Finchley, then the constituency of Prime Minister Margaret Thatcher, that Mr Bercow became involved in politics. He joined the right-wing Monday Club, but later left, describing the views of some members as "unpalatable". At Essex University Mr Bercow became chairman of the Federation of Conservative Students, an organisation closed down in 1986 by Conservative Party chairman Norman Tebbit because of its radical stances and sometimes raucous behaviour. Mr Bercow was elected Conservative MP for Buckingham in 1997. But in the early 2000s his political views altered. He became a champion of gay rights and said a clampdown on cannabis smokers would be "absurd". After entering the shadow cabinet, he called for Conservative MPs to be banned from membership of the Monday Club. Just a few minutes before he made his comments on Mr Trump on Monday, Mr Bercow announced that he was ending the requirement for Commons clerks - the advisers who sit in front of him - to wear wigs. This didn't go down too well with some MPs, who said this could undermine Parliament's standing and ignored tradition. But Mr Bercow said he wanted to make the Commons look "marginally less stuffy and forbidding". After becoming Speaker in 2009, he updated his own attire by wearing a business suit, rather than the knee breeches and tights worn by his predecessors. And last week he invited Conservative MP Chloe Smith to bring her baby into the chamber during a vote on Brexit. Mr Bercow has been praised for ensuring that backbench MPs get a proper chance to question ministers. He has also had run-ins with several politicians, some of whom think he is a little too fond of his own voice. Perhaps the most notorious dispute was with Conservative MP Sir Simon Burns, who in 2010 called him a "stupid, sanctimonious dwarf". Mr Bercow also rebuked Prime Minister David Cameron - his old tennis partner - and once cut him off mid-point at PMQs. He has turned on other ministers, including one who used his smartphone in the chamber. Some Conservatives have complained that the Speaker has not always appeared impartial. John Bercow was not a popular choice as Speaker with his fellow Conservative MPs - although it was a secret ballot the widely-held belief is that he won his 2009 election largely as a result of backing from Labour MPs. In 2015, a visibly moved Mr Bercow survived an attempt by the Leader of the House, William Hague, to remove him from office. He was applauded by opposition benches, as happened on Monday when he made his remarks about Mr Trump. After the 2015 vote, the Telegraph journalist Bobby Friedman wrote: "The Speaker is the archetypal Marmite man, loved by some, but loathed by many others. This is not simply a matter of mild dislike or a vague irritation." She has disappeared somewhat from public life recently, but for a while Mr Bercow's wife Sally garnered at least as many headlines as the Speaker himself. A former right-winger who moved to the Labour Party, Mrs Bercow ran unsuccessfully for Westminster Council in 2009. She appeared on Celebrity Big Brother in 2011, being the first contestant voted off the show. During the same year she appeared in the London Evening Standard, wearing only a bed sheet and proclaiming that her husband's status acted as an "aphrodisiac". The Bercows, who live in a flat in the Palace of Westminster, have three children.